I found this plant in my sweet corn patch. It captured my attention, because the ear is at the top of the plant with the tassel. It must be a genetic throwback to when corn was just another tall grass. Normally, the ear is located one-third to one-half way up the stalk. And I realized this is the reason corn can be so productive compared to other grains such as wheat, oats, or barley. On our farm, corn can produce more than 9,000 lbs. per acre. 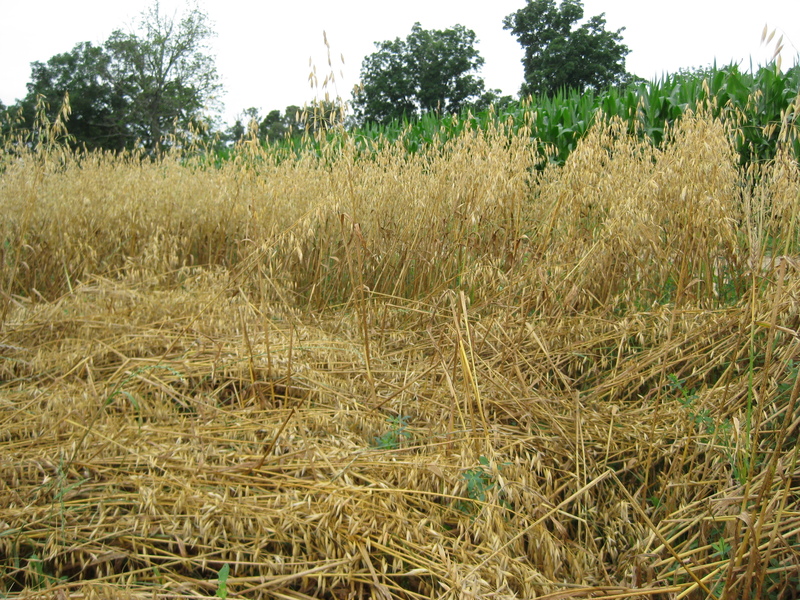 Oats only produces about 3,000 lbs. per acre. Corn carries all of the grain weight lower on the stalk. All other grasses and grains that I know of carry their grain weight at the top of the stalk. This causes them to be susceptible to lodging or breaking over. Here is a picture of some of our lodged oats. More of a challenge to harvest, but we finished harvesting the oats last Wednesday. This entry was posted on Sunday, July 25th, 2010 at 10:10 pm and is filed under Curious crops. You can follow any responses to this entry through the RSS 2.0 feed. You can leave a response, or trackback from your own site. I suppose location of the seed is all part of getting the best shot at reproduction of the species. The higher up on the plant, the further it will potentially travel before hitting the ground. I noticed the corn at the farm I grew up on was a lot taller than I remember it being when I was a kid. I surmised that the idea is probably to engineer taller plants to try to get more ears per stalk, thus improving per acre yield. Do you know if a taller corn is something that has been a target of genetics over the years? Yes, taller corn is selected for varieties that are designed to be used for silage. (The whole plant is used in corn silage). Plant breeders used to select some varieties for multiple ears and ears that would “flex”, (grow larger if conditions warranted). 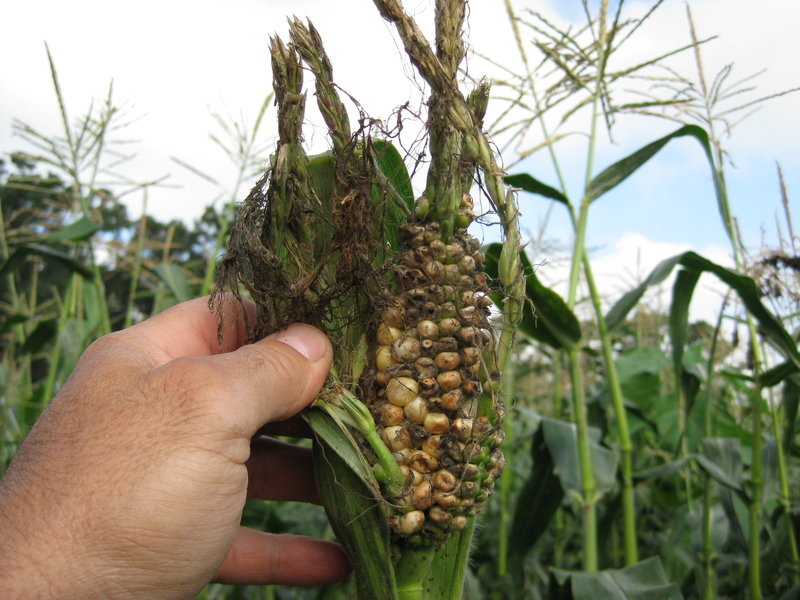 Now the emphasis is mainly on corn plants that produce an ear no matter what and tolerate extremely high populations. We plant 30,000 plants per acre. Sweet corn is a different ballgame because each ear matters, as that is what people eat. So we only plant 20,000 plants per acre of sweet corn.